The final of the 65th Japan Collegiate Baseball Championships held at Jingu Stadium on June 11 was played by the two colleges which have never reached the top, and Chukyogakuin University (Tokai Regional University BBL) beat Chuo Gakuin University (Chiba University BBL) 5-2 to capture their first ever crown. Although Chukyogakuin was not among the favorites out of the 27 competitive Regional University Baseball Champions in Japan, they routed former champions Nihon Bunri Univ., Toin Univ. of Yokohama and Asia Univ. in the elimination tournament. 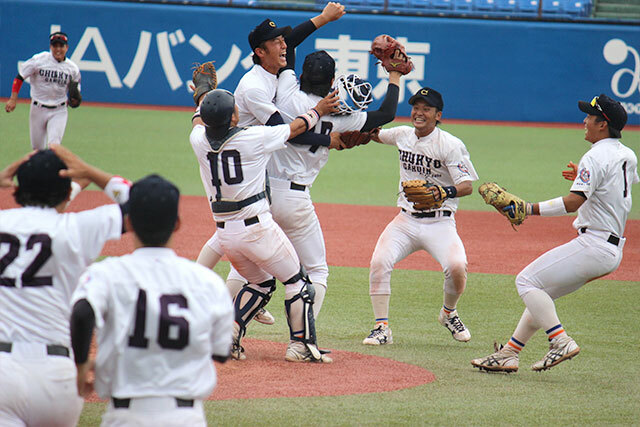 In the semi-finals, Chuogakuin rallied back from a two-run deficit after one out in the top of 9th inning before, the game was tied, the bases loaded with two out and an Ishizaka’s walk-off single gave Chukyogakuin a 5-4 win over Naragakuen Univ. Yoshitaka YAMAZAKI, catcher of Chukyogakuin awarded MVP and Leading Hitter .471, Yuta YANAGAWA of Chukyogakuin Best Pitcher 1.08, Seitaro SHIKI, infielder of Chukyogakuin Fighting Spirit Prize and Keisuke SUZUKI, pitcher of Naragakuen Special Award. All-Japan University Baseball Association will host 40th U.S.-Japan Intercollegiate Championship in Japan from July 12 to 17, 2016 and 50 candidates have been selected to prepare for the event.